April 20th 2008 was the 200th anniversary of the birth of Louis-Napoleon Bonaparte. He later become Emperor Napoleon III of France, but was deposed in 1870 after the disastrous Battle of Sedan. He was released to live in England, and stayed at Camden Place, Chislehurst, until his death in 1873. Louis-Napoleon was the nephew of Napoleon Bonaparte, and was born in Paris. He was exiled, as were all his family, after Napoleon was defeated at the Battle of Waterloo in 1815, and spent many years in England and Germany. In 1840 he attempted a coup d’etat after sailing to Boulogne, but was arrested and imprisoned, before escaping back to England. It was not until 1848, after the fall of the Bourbon monarchy, that he was able to return formally to France where he was elected President of France in 1849. The constitution of France at the time only allowed one term of four years as President, but in 1853 Louis-Napoleon staged a real coup d’etat and seized for himself and his government dictatorial powers. Eleven years later, in December 1864, following a referendum, the Second French Empire was established, and Louis-Napoleon was declared Napoleon III, Emperor of France. Louis-Napoleon’s connection with Chislehurst and Camden Place is an interesting one. While in England he had formed an attachment to a young English beauty, Emily Rowles, whose father owned Camden Place in the 1830s and Louis-Napoleon visited her often there. Emily was to remain a supporter of Louis-Napoleon for many years, and assisted his escape from French prison in 1846. He had also paid attention to another English girl, Elizabeth Howard. Elizabeth later gave birth to a son, whose father (not Louis-Napoleon) settled property on her to support the son, via a trust whose trustee was Nathaniel Strode. Strode bought Camden Place in 1860 and spent large sums of money transforming it into a French chateau. It later transpired that Strode had been receiving money from the Emperor during this time. Louis-Napoleon had a number of romantic attachments in addition to the two mentioned here, and fathered at least two illegitimate sons. A large part of the time of his social secretary was to deal with his affairs. His wife, Eugenie, the daughter of a Spanish nobleman, Count of Teba, bore him their only legitimate son, The Prince Imperial, and heir to the Empire. Louis-Napoleon’s reign as Emperor was not long-lived, and after the disastrous Battle of Sedan in 1870, in the war against Prussia that he had initiated, he was deposed and the Second Empire came to an end. When Louis-Napoleon was deposed, his wife and son fled to England, where they soon learned, to Eugenie’s apparent surprise, that Strode was offering them the use of Camden Place. The deposed Emperor was soon released, and on March 20th 1871, he arrived by train at Chislehurst. For two years Chislehurst was a hive of diplomatic activity and intrigue (it is rumoured that French spies had installed themselves in the old windmill at Chislehurst). Louis-Napoleon was not now a well man, and he died on January 9th 1873. He was buried at St Mary’s Church in Chislehurst, after a spectacular funeral procession through the village. The mausoleum designed to house his remains is a curious addition to a village church. Click here to read a contemporary account of the events following Louis-Napoleon’s death. But his body was not to remain there long. 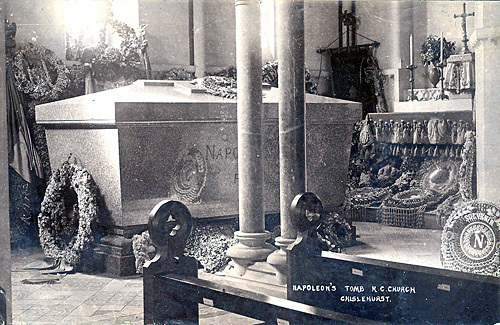 After the tragic death of the Prince Imperial in South Africa in 1879, the Empress decided that she wanted a larger memorial to her husband and son than could be provided in Chislehurst, and in 1888 Louis-Napoleon’s remains were taken to St Michael’s Abbey, Farnborough, Hampshire, where they remain to this day. The Empress had left Camden Place in 1881 to live in Farnborough, where she oversaw the building of the Abbey. She died in 1921. Despite his reputation as a dictator and war-maker, Napoleon III is now regarded as having enabled France to modernise itself. He oversaw the rebuilding of Paris, the establishment of a modern financial system in France, and the building of the French railway network. He is recognized as the first ruler of France to have taken great care of the economy.